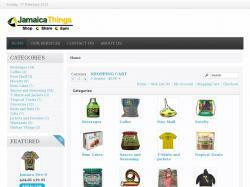 Jamaicathings.com is the place where you shop, create and sell Jamaican things. Shop for Blue Mountain coffee, rum cakes, t-shirts, ting, souvenirs and more! The site also has a Custom Products section, where users can upload their images to be printed on T-shirts, Puzzles, Mouse Pads, and other imprint products.